Istria is the most developed of the Croatian regions in terms of tourism due to its vicinity to Western Europe. The peninsular is large and triangular, pointing into the Adriatic. Although the coast is less developed and built in the south of Croatia like in Dalmatia, it is an attractive region for holidays as it offers good facilities on the coast and has an interesting inland, which is largely unspoilt and gives an insight into Croatian culture. As a border region with Italy and Slovenia, it has a rich cultural life, marked by the cultures that have lived it during many centuries. There is still a large Italian community there, and most Croats will know some words of Italian. Main towns to see in Croatia include Pula, Rovinj, Novigrad, Poreč, Motovun, Grožnjan, Oprtalj and Hum, which are presented in details in the town sections. 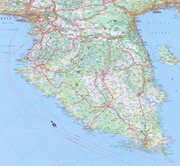 Istria is connected to Zagreb with bus lines and it is easy to reach Istria from Rijeka, there is a train from Ljubljana to Pula, and there are ferries connecting Pula with Lošinj and Zadar. If you want to travel on other routes as the ones indicated here, you are advised best to take a car. Hotel-Istria.com offers the best choice of hotels in Istria. This article needs your support to be finished. If you know more about Istria please add your knowledge to this article. On this page you can find more information of how you can contribute to this wiki.